Price: Free. Premium version from $3.00 / Month. 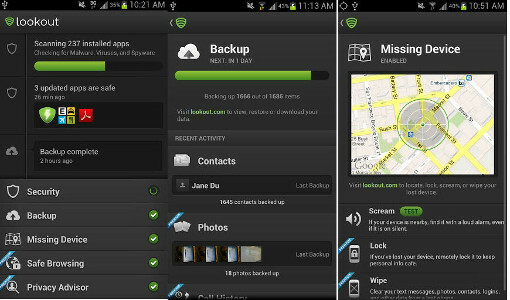 Lookout protects your mobile from viruses, malware and spyware and more. Once installed it sits permanently in the background scanning your apps, emails, etc for any problems. It also backs up your personal data, contacts, etc. to your Lookout account for easy retrieval or transfer to a new device. It has a neat feature to find your phone if lost and even sound a loud alarm or make your phone SCREAM to find it. Privacy Advisor that reports which apps are accessing your identity info, contacts, messages and location. The free install automatically comes with a 14 day trial of the Premium version. Grab the Android app here. Grab the iTunes app here. If you have had experience of this particular Mobile App please submit a User Review via the tab above. If you wish to discuss Mobile Privacy in general please visit the related discussion topics of our forum.